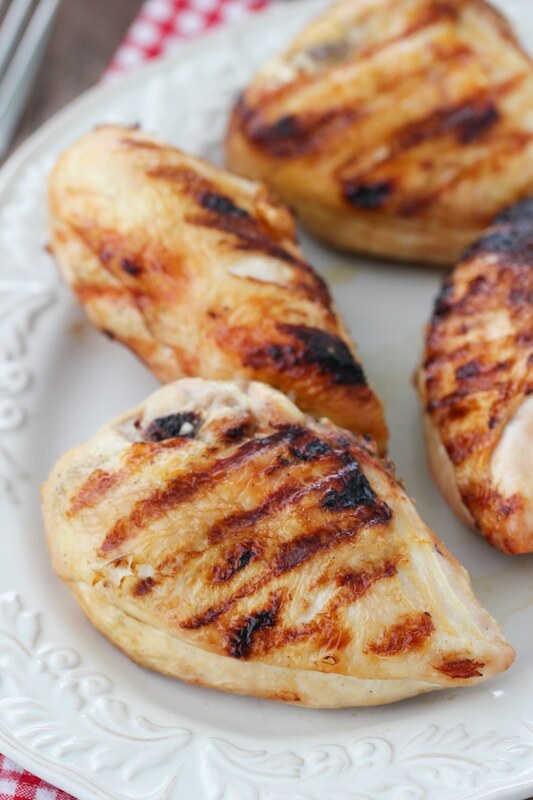 Grilling Chicken Breast that is juicy and full of flavor can be achieved by brining it and also being careful not to overcook it. Use this as a basis and add sauce to the chicken or serve the chicken in burritos, pasta, rice, in salads and in a ton of other different ways. 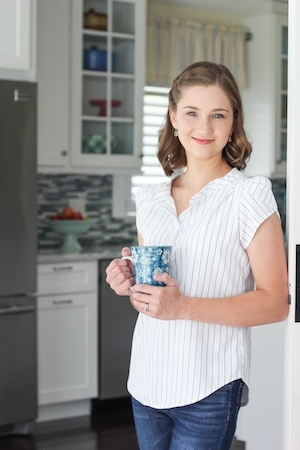 This is one of my go-to meals for family dinners as well as when we are entertaining guests in our home. It’s so easy to prepare and is very versatile. You can pair it with almost anything and keep it simple, like roasted potatoes or rice and a salad. You can also build on it with other things and serve it with burrito bowls, make fajitas, or add it to numerous pasta dishes. 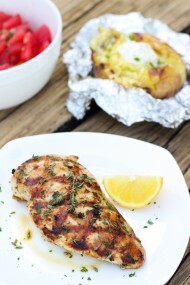 Grilled chicken breast gets a bad rap because most people associate it with being dry and bland. 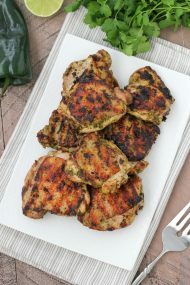 However, with this recipe, you will be amazed at just how juicy and flavorful grilled chicken breast can be. The #1 thing that I hear from my guests whenever I serve this chicken is, “Wow, it’s so juicy!”. Brining the chicken makes it super juicy and flavorful all the way through, even to the center of the meat. You can also glaze it with different things to change the flavor to what you are craving for dinner that night, such as barbecue sauce, apricot or orange preserves, apple jelly, pepper jelly, etc. In a large bowl, combine the water with the salt, sugar, bay leaves, peppercorns, and garlic. Whisk this all together until the salt and sugar dissolve. 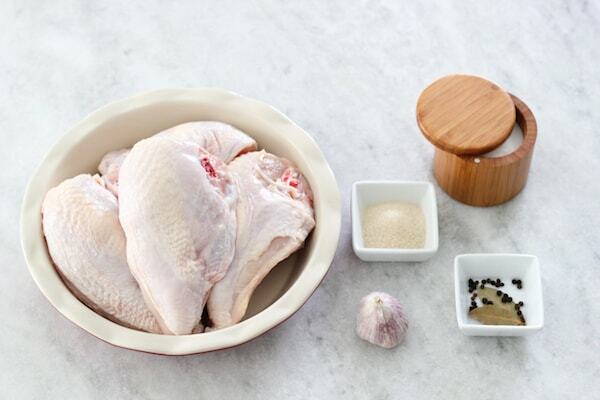 Place the chicken into the brine so that it is completely submerged. 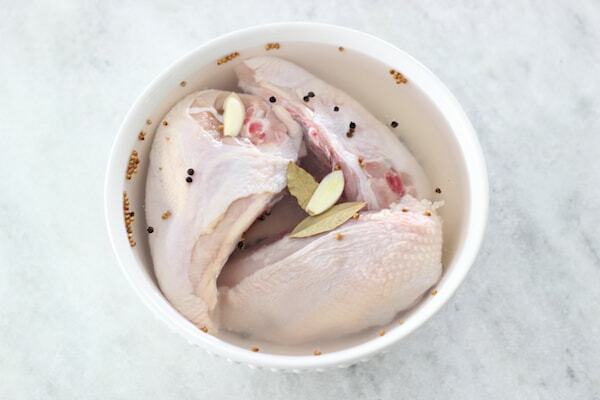 There is enough brine that you should be able to use it for up to 6 chicken breasts. Cover and refrigerate for an hour. 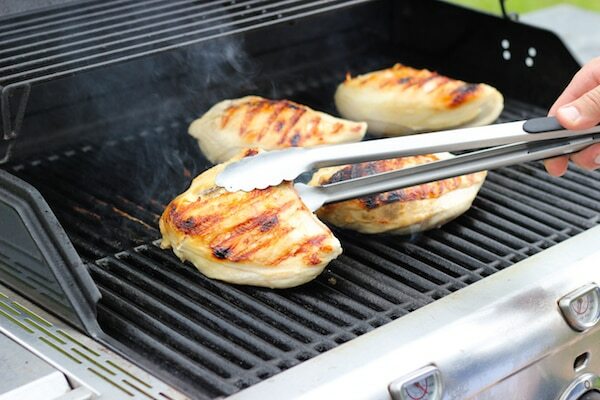 Grilling chicken breast with the bone in and skin on will make it so much juicier than if you would use boneless skinless chicken breasts. I always cut the chicken off the bone and slice it before serving, so it’s not a hassle for your guests. 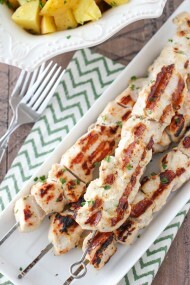 If you want to grill boneless and skinless chicken breasts, I have another recipe that you can try. 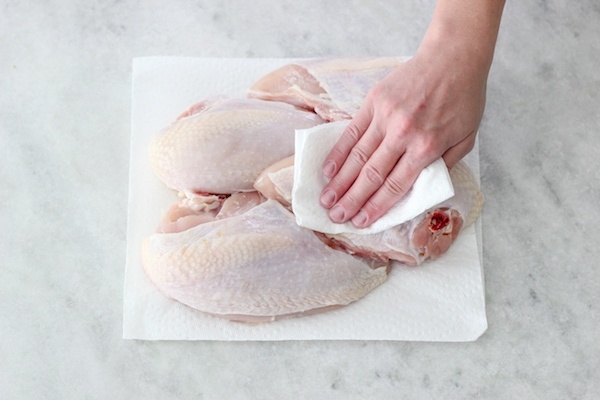 After an hour, pour off the brine and pat the chicken dry with paper towels. You can do this up to a day in advance and keep the chicken in the refrigerator. This is awesome for dinner parties since it will be ready to go in advance and you will have more time for other things. Preheat your grill on high heat for at least 15 minutes, covered. Clean your grill grates. Take a wad of paper towels and holding them with a pair of tongs, dip them into a small bowl of oil and brush the grill grates 3-5 times. This will help to create a barrier on the grates, making them somewhat nonstick. 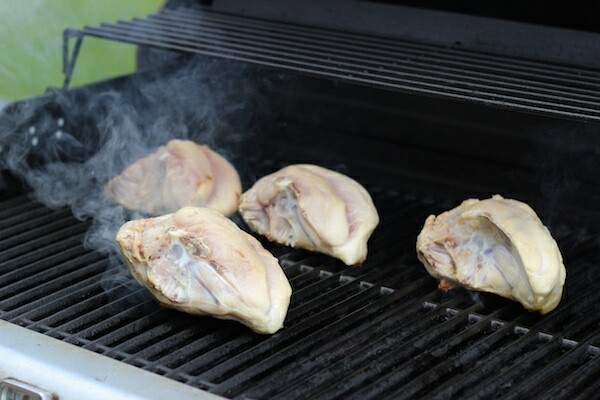 Reduce the heat to medium high and place the chicken skin side down onto the grill grates. Grill the chicken until it is golden brown, about 10-15 minutes and then flip it over, continuing to grill it until the chicken is completely cooked through, 160 degrees Fahrenheit in the center of the chicken breast on an instant read thermometer, another 15-25 minutes, depending on the size of the chicken breast and on the heat of your grill. 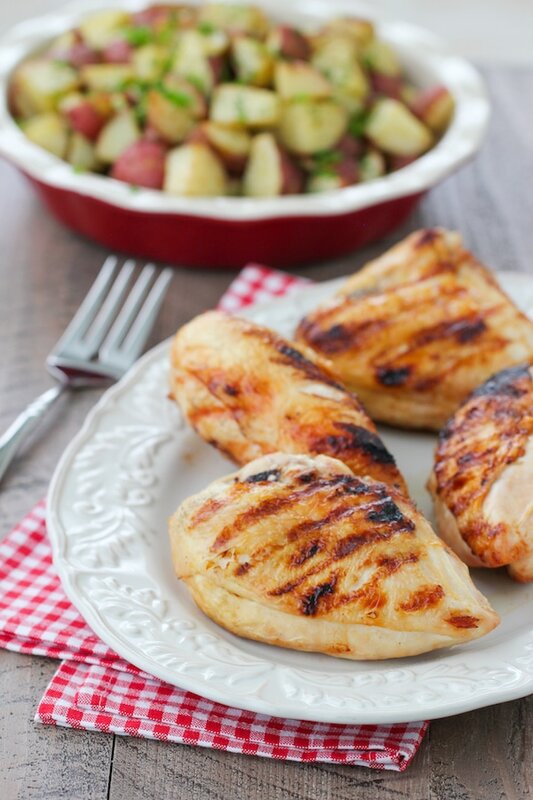 If you are using a glaze, brush it on top of the chicken 8-10 minutes before it is finished cooking and again right before taking it off the grill. Glaze ideas: barbecue sauce, sweet chili sauce, pepper jelly, apple jelly, apricot or orange preserves, honey mixed with lemon juice and minced garlic. 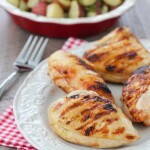 Take the chicken breast off the grill and allow it to rest for 10-15 minutes before slicing it. 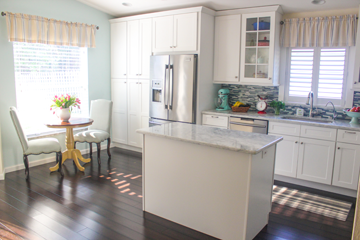 Olechka, Thank you for sharing another successful recipe! 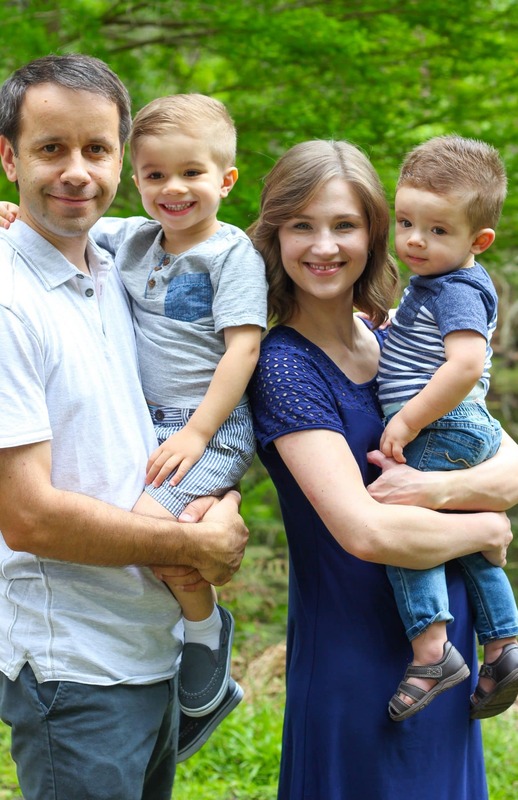 My family thanks you! Thank-you so much for your wonderful recipe. God bless you and your family.